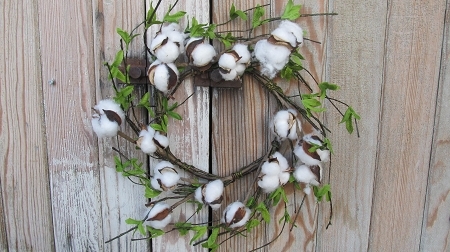 Country Cotton Ball Wreath with Leaves. Very trendy cotton ball wreath with small green leaves incorporated in. Has a great farmhouse or spring look. Inside diameter is 6"-6 1/2" then depending on how big you shape the stems to be it can vary from there. Great detail. Interior use is recommended.